Why the real time export for attendance is not working? This article contains steps to fix the problem Real-Time Export is not working properly. › Real time export is not working. › Real time export for attendance is not exporting. 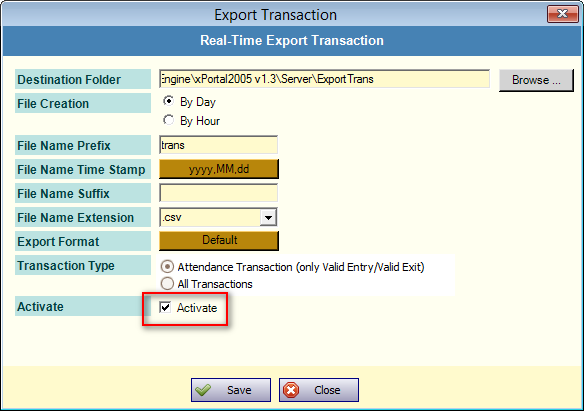 › Real time export for attendance is stop exporting. › No real time transaction report is generated in the export transaction destination folder/ path directory. › Unable to find the real time export transaction report in export transaction destination folder. › Transactions exported are stop exporting at export transaction destination folder. › Real time export is not activated. › No access at current time. › No current transaction shown in the software - transaction report in specific time. › Make sure the real time export setting is activated. › Make sure the controller status shown from the Device List is always "Up". › Make sure software is always running to capture all attendance. Please follow steps below to configure real time export correctly. Make sure the real time export is activated. Make sure the controller status shown at the xPortal Software from the Device List is always "Up". Make sure software is always running to capture transaction according to the Transaction Type selected. Transaction exported is based on "Valid Entry" or "Valid Exit" transactions only. Transaction will stop exported when no more "Valid Entry" or "Valid Exit" transaction pull back from the controller to the software. Transaction exported is based on all transactions pull back from the controller to the software. Summary: This article contains steps to fix the problem Real-Time Export is not working properly. My server restarted when it rebuilding the attendant. then it cannot auto-generate attendant report again. what can i do? Err frm server.Err Typr= ArgumentException;Err Message = Index was out of range. Must be non-negative and less than the side of the collection. This is database-related issue and it is difficult for us to guide you the solution from here. Our Technical Support team will reach you through email as soon as possible and will help you to troubleshooting the problem. Please make sure you have activated the Real-Time Export Transaction settings. The report will be auto-exported according to the settings you have saved. Note: Please ensure the controller is always "Up". Hi, I'm trying to use Real Time Export but failed. It work fine before. And I also can't do transaction report. ( Reporting-Transaction Report). The staff attendance record still show in latest event list. Any ideas on how to solve this? 1. Is the Real-Time Export settings activated? Please be reminded that transaction will stop exporting when no more "Valid Entry" or "Valid Exit" transaction pull back from the controller to the software if you choose Transaction Type: "Attendance Transaction (only Valid Entry/ Valid Exit)". 2. Is there any error message shown when retrieving Transaction Reporting? If you could elaborate more of your problem that would suffice us to help you. Hi, I've tried the steps above. It's still not working. Any idea how to solve it?